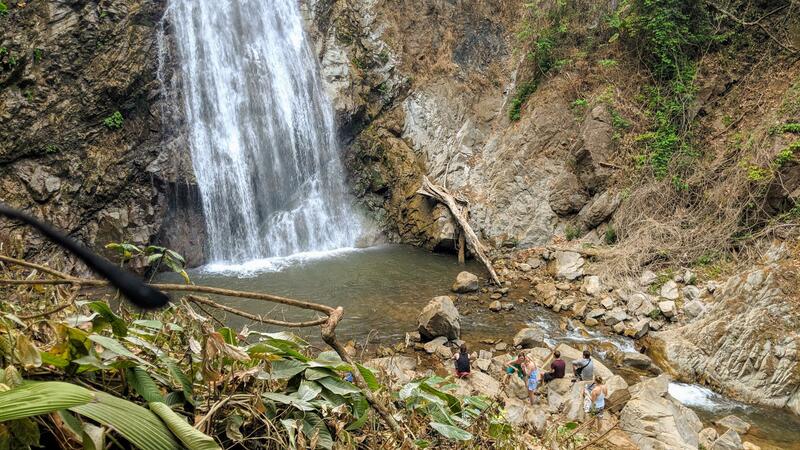 I’d never even heard of Khun Korn waterfall until a friend from the hostel recommended it as one of the best things to do near the White Temple in Chiang Rai so we should combine the two. I didn’t do any research or know what to expect, we just went and were absolutely blown away with how beautiful it was! We were visiting on scooters, it was about a 25 minute drive from the White Temple so they make a great day trip from Chiang Mai. You may find it difficult and expensive to visit the waterfall using taxis or tuk tuks as it is very remote so I’d recommend driving or taking an organised tour. The drive up to the waterfall was incredible. As we drove away from the hustle and bustle of Chiang Rai and the White Temple, everything became much quitter and our surroundings slowly turned green. There was also a noticeable drop in temperature from the humidity of the city which was very welcome. The waterfall itself was not signposted that clearly so you could easily miss the turning, I’d recommend looking out for signs to the White House Boutique Resort as this is easier to follow and is located on the road up to the waterfall. Unfortunately, we didn’t realise that there were opening times for the Khun Korn forest park where the waterfall is located, so we ended up arriving a little before last entry at 4.30pm. This still allowed us just over an hour until closing at 5.30pm but we could have happily spent a few more hours seeing the waterfall and exploring the surrounding areas. There was no entrance fee to visit the waterfall. After leaving our scooters in the car park, we had to hike about 1400m through the jungle to get to the waterfall itself. Despite being a little slippery in places, the trail was so beautiful, rafts of light streamed down through the bamboo trees and butterflies floated past out eyes, it was really nice to get out in to the natural environment away from the smog. As we hadn’t done any research prior to our visit, we hadn’t come prepared for the hike but luckily it was relatively straight forward and would be suitable for children too, just watch out for some slippery parts. TIP: Don’t be fooled by the natural looking trail that you spot at the beginning, stay on the left hand path past the toilets to get to the waterfall. Keep an eye out for the trees that Buddist monks have marked as holy by wrapping them in orange cloths. After hiking for about 20 minutes we finally approached the waterfall and it was breath-taking. I couldn’t believe how big it was. At 70m tall this is the biggest waterfall in Chiang Rai and it makes you feel very small. Without even going close to the water you can feel the mist spraying from it as the water tumbles down the rocks. After spending some time taking in the beauty of the waterfall, we changed in to swim wear and took a refreshing dip in the splash pool beneath. It’s not very deep and wasn’t too cold either. Even though out experience was slightly rushed, visiting at the end of the day has its advantages as most people were leaving so we ended up having the waterfall to ourselves, this made for some great selfies! It was dead on 5.30pm as we were leaving and the guards were just closing the gates, make sure you’re out in time else you may not get your vehicle out. The journey back was just as beautiful, every glance in my wing mirror I’d see the bright orange glow of the setting sun, it’s the unexpected adventures that are the best.